Recently I published a blog about creating collections for SCCM client installation failures by error code. In this post, I will do the same for Software Update installation failures. 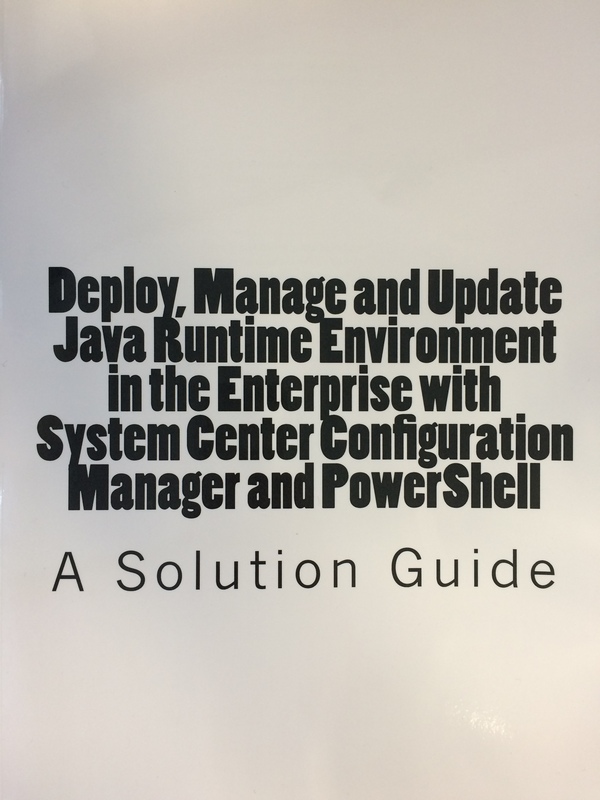 If you’re lucky enough not to have any errors installing software updates with SCCM, then this post isn’t for you, but if you do experience installation failures it can be helpful to collate machines with the same error into collections so you can easily target them for remediation using the SCCM Scripts feature for example, or just for visibility and reporting. To find which software update installation errors you are experiencing in your environment, you can run the following SQL query against the SCCM database. This will find systems in the “Error” or “Unknown” enforcement states for software update deployments and group them by the enforcement error code. Next is a PowerShell script that will create collections for each error code. You need to specify the error codes in the Error Code translation table in the script. I’ve included some common error codes for software updates and their friendly descriptions – add or remove error codes according to your own environment. To translate error codes to friendly descriptions, see here. Run the script on a site server or anywhere with the SCCM console installed. I’ve split the collections between those with an “error” enforcement state and those with “unknown” as you may wish to handle them separately, and placed the collections for each state in different sub-folders. You may wish to be more targeted in the WQL query for the collection rule, targeting only certain collections or deployments etc. For example, you can add a ‘where’ clause for SUM.CollectionName to target particular collections, or SUM.AssignmentName to target specific SUG deployments. Here’s what the end result will look like. The error description is added to the Comment field, so just add that in the console view. Windows Presentation Foundation (WPF) is great for creating GUI applications, but it does not natively contain any charting controls. There are a number of products that can be used to create charts in WPF, including the WPF toolkit and the Microsoft Chart Controls for .Net, but good-old Windows Forms does this natively. WPF has does have a WindowsFormsHost control, but there are a number of potential issues with hosting Windows Forms in a WPF application, and it not recommended practice. 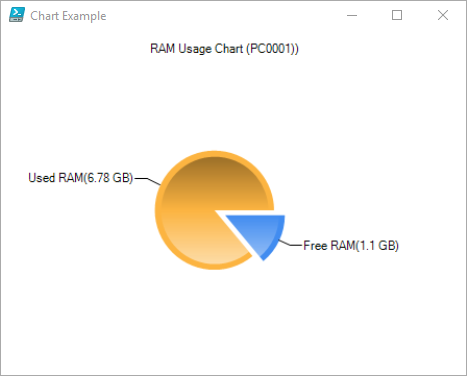 After some playing around however, I found it is possible to add a Windows Forms chart simply by displaying it as an image. Furthermore, it is also possible to save the image to a memory stream in binary format, which means it does not need to be saved to disk as a file, but can simply be stored and read from memory in binary form. $datapoint.AxisLabel = "$($_.Value.Header)" + "(" + $($_.Value.Value) + " GB)"
$Chart.Titles.Text = "RAM Usage Chart ($($env:COMPUTERNAME))"
Thanks to everyone who reported the bug! Today I reached 10,000 hits on my blog, very cool, and what better way to celebrate than with a new post 🙂 Thanks to everyone who has stopped by, I hope that you have found something helpful and continue to do so! In today’s post, I want to look at how to create dynamic reports for ConfigMgr using Microsoft Excel. 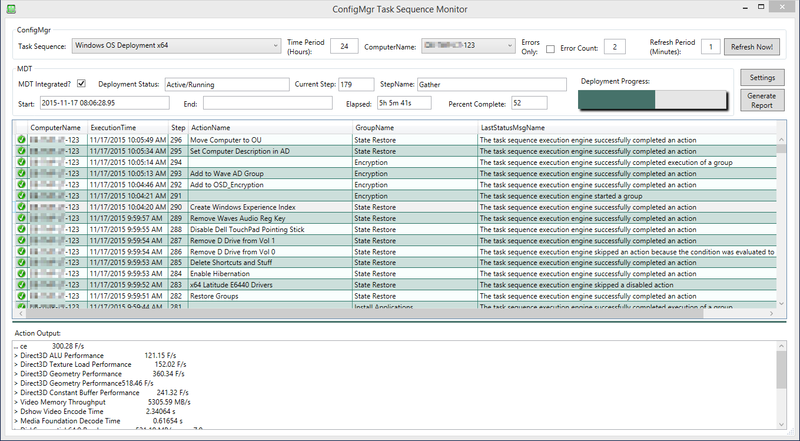 Excel has the ability to create and store a SQL server connection, so we can use it to talk directly with the ConfigMgr database and pull data into our worksheets, where we can summarize, combine, perform functions, display charts etc. 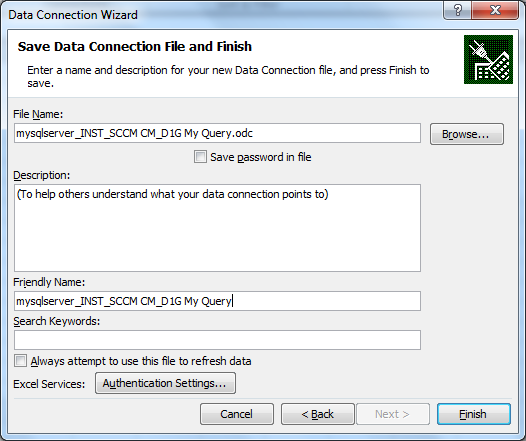 In addition, the SQL connection can be refreshed meaning that the report can always have the most recent data from the database. Excel is a very handy tool to use to create reports from the simple to the complex, and is a great option for use with Configuration Manager. The built-in reporting capability of Configuration Manager is of course very good. The SQL Server Reporting Services reports are all predefined for you and allow you to get some very useful information. You can also create custom reports, subscriptions, export data and share reports with interested parties. 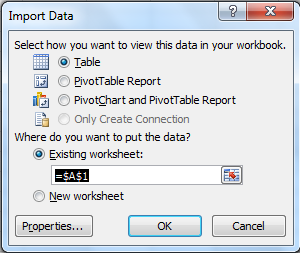 But I find there are still some limitations that can make Excel an attractive alternative when creating custom reports. For one thing, finding the data you want can sometimes mean drilling through more than one report and selecting various options. And then I often find that the data I want is not readily available in a single report and I have to create a custom report to get it. But creating custom reports with SSRS is a bit of a slow and cumbersome process. I have used Excel for reporting to great effect, and if time permits I will share some of the reports I’ve created in future posts, including a spreadsheet to dynamically monitor SCCM OS Deployments and a single report that will get the current deployment status of any ConfigMgr Application. 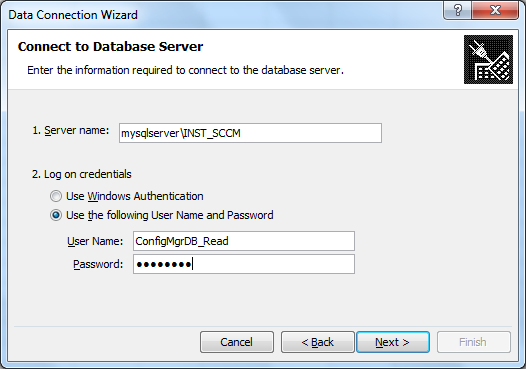 The first thing to do is to decide which account will be used to get access to the ConfigMgr database. If you are creating a report that is for your own use only, then there is no need to use specific account credentials, you can use the built-in Windows authentication option (assuming you have access to the database with your account). If your report will be made available to other users, then those users will need at least read access (db_datareader) to the SQL database so the SQL query that runs in the background has permission to do so in their user context. There is, however, a viable alternative if you don’t want to assign SQL permissions to all the users who need to view the report – you can create a local SQL account that has db_datareader access to the database, and embed these credentials in the report. There is a security consideration here, as the local SQL credentials will be stored in clear text within the workbook, but since the permission level is read-only that should not be a major concern, and this is the method I will use in this post. Open Microsoft Excel (I’m using 2013, but it’s almost the same in 2010) and go to the Data ribbon. 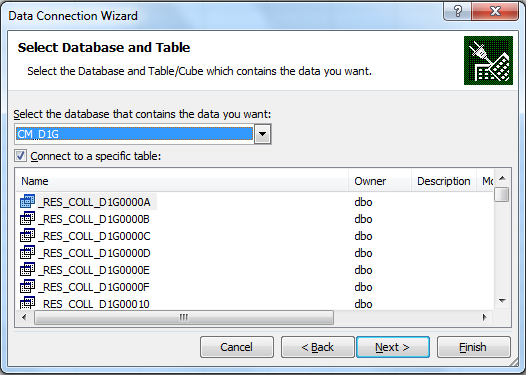 In the Get External Data section, click From Other Sources, then From SQL Server. 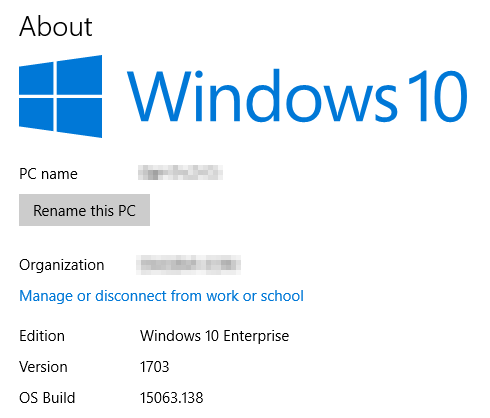 In the Data Connection Wizard window, enter the name of your SQL server and instance that hosts the ConfigMgr database, and enter the SQL credentials to connect to it. Select the ConfigMgr database in the drop-down list. At this point we cannot enter a specific SQL query, so we have to pull in any random table for now, then we’ll update the connection later. Click Next. 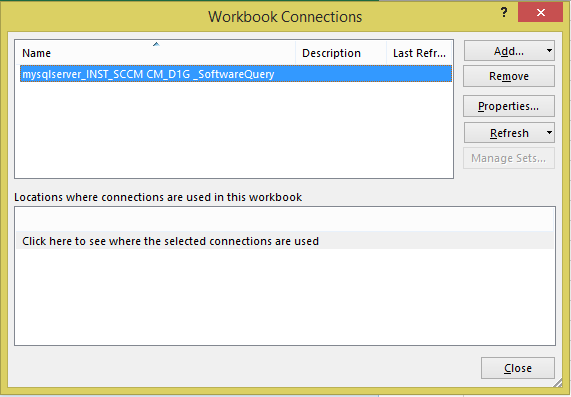 You can change the File Name and Friendly Name of the data connection to make it more obvious as to what data it is getting, and to distinguish it from other data connections you may create in the workbook. At the Import Data window, click on Properties. In the Connection Properties window, on the Usage tab, make sure that Enable background refresh is selected, and also Refresh data when opening the file. This allows us to run the SQL queries in the data connections automatically every time we open the Workbook, and also perform a manual refresh when desired, from the Data ribbon. 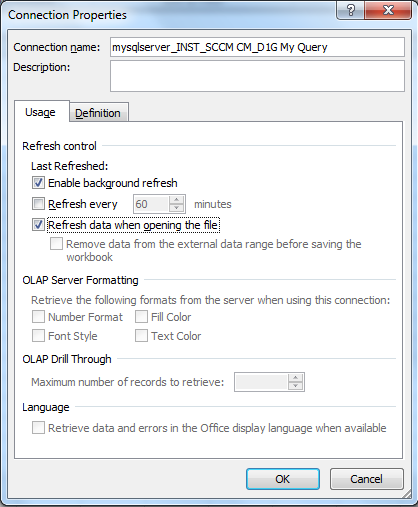 Optionally, you can also refresh the data regularly using the Refresh every .. minutes option. On the Definition tab, check the option Save password. You will be prompted to allow the saving of the password unencrypted in the Excel file. Click Yes. You can expand the window if you have a large query and need to see more of it. Click OK, and you will be prompted that the connection has now changed in the Workbook, click Yes to accept. Back in the Import Data window, make sure that Table is selected and the cell range =$A$1 in the Existing worksheet, then click OK.
You can see that it places a filter on all the column headers, making it easy to filter your data. If you need to edit your SQL query, you can do so from the Data ribbon. Click Connections, select the data connection and click Properties. You can now go to the Definition tab and edit your SQL query as required. 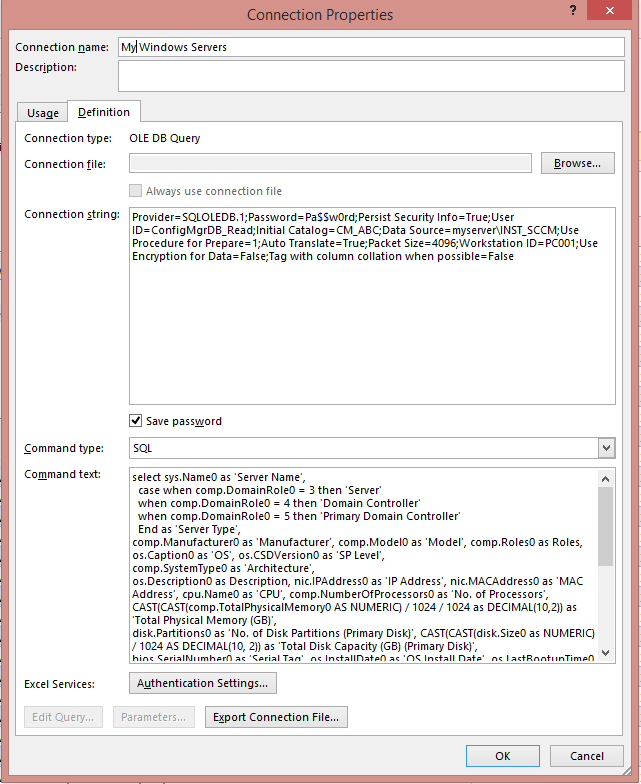 An alternative way to get data from ConfigMgr into Excel is to use Microsoft Query. This is a kind of ‘gui’ way to construct a query and may be useful if you are not familiar with creating SQL queries directly, although I find it easier to create the queries myself! We won’t cover Microsoft Query in this post, but to get started with it, simply click on the Data ribbon in Excel, and choose Get External Data > From Other Sources > Microsoft Query. Your report will only be as good as your SQL querying skills, your Excel skills and your knowledge of the ConfigMgr database of course, but on the latter Microsoft has provided some nice documentation (here) to help you find your way around the available SQL views. In most cases you will query the views not the tables as they are designed for that, so take a look through the Microsoft documentation to help you identify where to find the data you need. If you are familiar with querying WMI for ConfigMgr, then you should already find the database friendly as many of the views have similar names to the classes used in WMI. This was a simple example of a report that is not much different than running a WQL query in ConfigMgr directly. However, you can begin to understand the potential here if you create additional worksheets with their own data connections, and you have multiple SQL queries pulling data into one report. You can then create a summary sheet, for example, that summarises data from each of the worksheets, and populates graphs for a visually pleasing display. You can store this report in any network share and control access by NTFS permissions, or make it available in a document repository such as Sharepoint. The next time someone asks you for some data from ConfigMgr, you can simply send them a link.